Your adventure will begin enjoying the beautiful sights of Alabama only seen by water. The sunrise and sunsets are beautiful here, so no matter whether you choose an AM or PM departure, your day or evening will begin and end with spectacular views of the colorful skies. Capt. will guide you to various fisheries inshore where you can be certain to hook up on some beautiful and fun fighting fish. 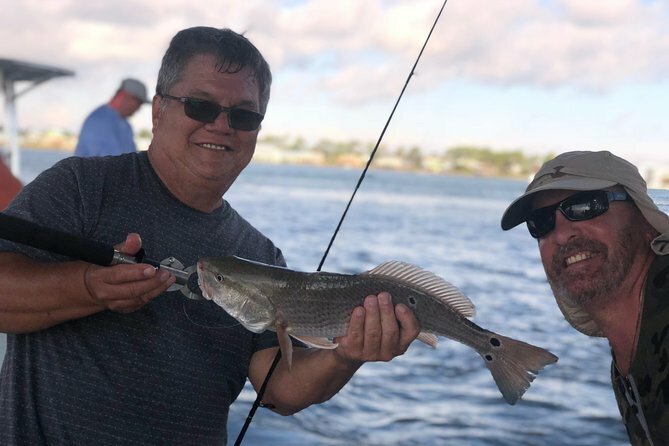 Whether it be the rock jetties or bridge footing in Perdido Pass, or the grass flats in and around Ono Island or in the back bays, you will have a variety of opportunities to land some amazing Redfish, Speckled Trout, Black Drum, White Trout, Flounder, Mangrove Snapper, Sheepshead, Flounder or Blue Fish. Keep your eyes open as you never know when you will spot a school of dolphin playing, showing off their tricks or hunting for their own catch of the day! You will be stepping on board either our 2018 22' Mako Center Console running on a Mercury Verado 250, the boat is rigged with the latest and greatest electronics that include a Minn Kota Terrova trolling motor with I Pilot and Spot lock, a Lowrance 4G radar and Lowrance Carbon 12 Chart/Sonar, Sirius XM Marine Weather, Bluetooth Stereo, Sat Phone and Personal Locator Beacon, and also padded seating all around to keep you comfortable on the water.